Playoffs. The Lancers will travel to Chicago this Thursday, March 21st and face the 1st place Chicago Mustangs at 7PM at the Grand Sports Arena for the Eastern Division Playoff Finals. The Mustangs are 10-2 and the Lancers trail in 2nd place at 8-4. The Mustangs and Lancers have faced eachother twice during regular season, with the Lancers falling just short both games. The game will be streamed and can be viewed on both the Chicago Mustangs or Rochester Lancers Facebook Pages. The winner of this game moves on to the League Semi Finals in California, to face the champs from the Mountain & Pacific Divisions. Outdoor Lancers & Lady Lancers. 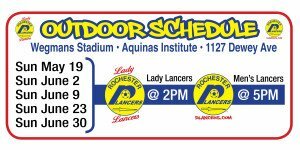 The Outdoor Lady Lancers of the UWS and the Outdoor Lancers of the NPSL seasons begin with a Doubleheader Home Opener this summer on May 19 at the Wegmans Stadium at the Aquinas Institute. Full schedule has been released, and more details can be found at RLancers.com. Indoor 2020. The Lancers 2020 Indoor Season Tickets are now on sale! Visit RLancers.com to secure a seat for next year at the IDE Family Field at the Dome Arena! Limited Season Ticket Seats will be sold for $120 for the 2020 indoor season. Visit RLancers.com to reserve.